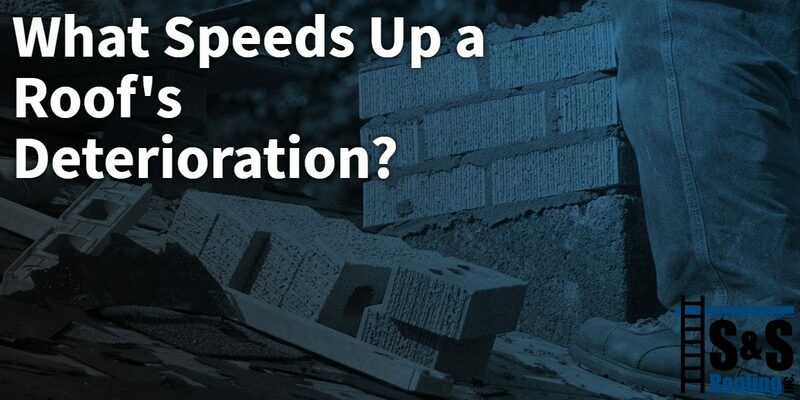 What Speeds Up a Roof’s Deterioration? When you had your roof installed, you probably thought that you’d have a system that would last for decades. While a properly installed commercial roof can give your building many years of protection, it must be inspected and repaired frequently. Routine maintenance from S & S Roofing can help you keep your roof in great condition for many years to come. However, when your commercial roof is neglected or not maintained as frequently as is best, it can break down. One of the most common causes of roof damage that we see is due to neglect. Simply put, if your roof is not regularly maintained and minor damage is not fixed, the materials will start to break down more quickly. Worst of all, those minor problems can turn into major issues when left unrepaired and can result in extensive damage that threatens the integrity of your entire roofing system. While these issues may not show themselves right away they may still be there. The best way to prevent damage is to schedule a routine inspection with your Top Rated Local® commercial roofing experts in New Jersey. The second most common cause of roof deterioration is due to weather. Your roof is exposed to a number of elements, especially here in New Jersey, whether your building utilizes a metal roof, a pitched asphalt shingle roof, or a standard low-slope design. The type of elements your roof sees throughout the year can directly impact how long the materials will last. There are two main types of weather-related deterioration that we see at S & S Roofing. Thermal Weathering: Thermal weathering occurs when a roof is exposed to frequent temperature changes and is more common in low-slope roofs using a dark colored membrane. Since darker material absorbs more heat from the sun, it expands more during the warm part of the day. As the temperatures cool off, the material contracts. The repeated expansion and contraction places stress on the material and often leads to cracks and weak points in the membrane. Surface Erosion: Surface erosion causes the gradual breakdown of roofing materials. As your roofing materials age, the damage the elements can cause increases. 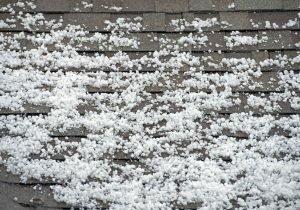 A period of heavy rain can wash away protective granules on asphalt shingles, and snow sliding off your roof can take bits of the material with it. Once those protective layers are removed, you may start to see blistering and cracking of the material, whether your building has asphalt shingles, or a low-slope roof. While you can’t prevent the weather, you can keep the damage it does to your roof to a minimum. Routine maintenance allows your roofing contractor to identify issues before they become significant problems and helps keep your roof in optimal condition for longer periods of time. Remember, a durable roof is a well cared for roof. Of course, when you suspect damage has occurred, it is imperative that you contact us immediately. No matter how mild the weather may be, a vulnerable roof is susceptible to issues that can create huge hassles down the road. S & S Roofing can help you with your roof damage as well as maintenance. No matter what kind of commercial roof you have at your building, the Top Rated Local® commercial roof repair experts at S & S Roofing are here to help. From seasonal roof inspections to complete repairs, our experienced contractors can help. We believe that roof repairs should be convenient for you. Our team will work around your schedule, whether you need us after-hours or on the weekend. Contact us today for more information.